As a new literacy drive is launched, authors including David Walliams and Michael Rosen warn of threat to storytelling from screens and busy lives. The childhood tradition of a bedtime story is in serious peril, as experts warn that parents are not making the time to read to their children at the end of the working day and stop reading to them at too young an age. One in five of the parents surveyed stopped reading aloud to their children before the age of nine, and almost a third of children aged six to 11 whose parents had stopped reading aloud to them wanted them to carry on. Frank Cottrell Boyce, who won the 2004 Carnegie medal for his first children’s book, Millions, was dismayed by the findings. “The joy of a bedtime story is the key to developing a love of reading in children”, he said – more so than literacy classes in school, which can be “a very negative experience”, for the many children he meets during visits to schools, whose first experience of books is in the classroom. 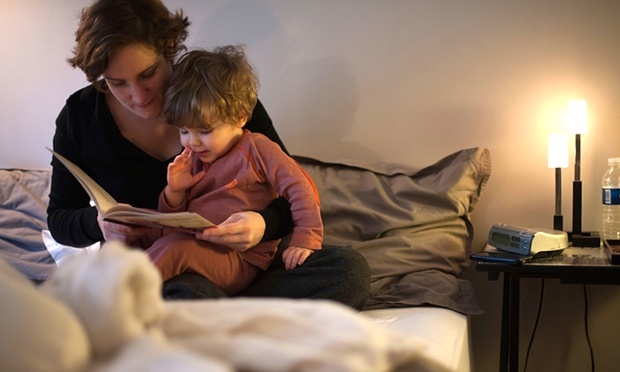 A survey by Settle Stories, an arts and heritage charity, of more than 2,000 parents with children aged four to 10 claimed that only 4% read a bedtime story to their child every night, with 69% saying they did not have the time. In February a study by TomTom of 1,000 parents of children aged one to 10 found that 34% never read a bedtime story to their children, with 29% blaming late working and 26% the daily commute. On Thursday the education secretary, Nicky Morgan, and the children’s author and comedian David Walliams launched the next stage of a joint literacy drive, announcing a target to make English pupils the most literate in Europe within five years. Currently, nine- and 10-year-olds in England are ranked sixth in Europe.